Tackle your toughest home, outdoor and auto cleaning projects with ease with the Sun Joe SPX4001 Electric Pressure Washer. Packed with 1800W of pure power, the 14.5 Amp motor generates up to 2030 PSI to demolish every last bit of dirt, grease, gunk and grime. Five Quick-Connect tips allow you to go from intense jet to gentle spray to suit the cleaning task and the onboard 1.6 L detergent tank lets you dial-in just the right amount of detergent to give your cleaning blast a boost. Featuring Sun Joe's exclusive Pressure-Select Technology, the SPX4001 lets you pick the perfect pressure to combat dirt and grime with professional results and a Total Stop power-saving system designed to save energy and prolong pump life when the trigger is not engaged. Other premium features on the SPX4001 include an onboard hose reel for quick and easy clean-up and storage, a 20 ft. high pressure hose and 20 ft. power cord. Cut your outdoor cleaning chores down to size and Go With Joe - the SPX4001 Electric Pressure Washer from Sun Joe. Get Equipped. Karcher's 1900 PSI K4 pressure washer delivers exceptional cleaning power for most cleaning jobs. The patented induction motor is water cooled to increase life up to 5X. The Vario spray wand allows for quick adjustment between low and high pressure without the need to switch nozzles. For stubborn stains, the patented Dirtblaster spray wand will clean up the toughest chores. Onboard detergent tank included. 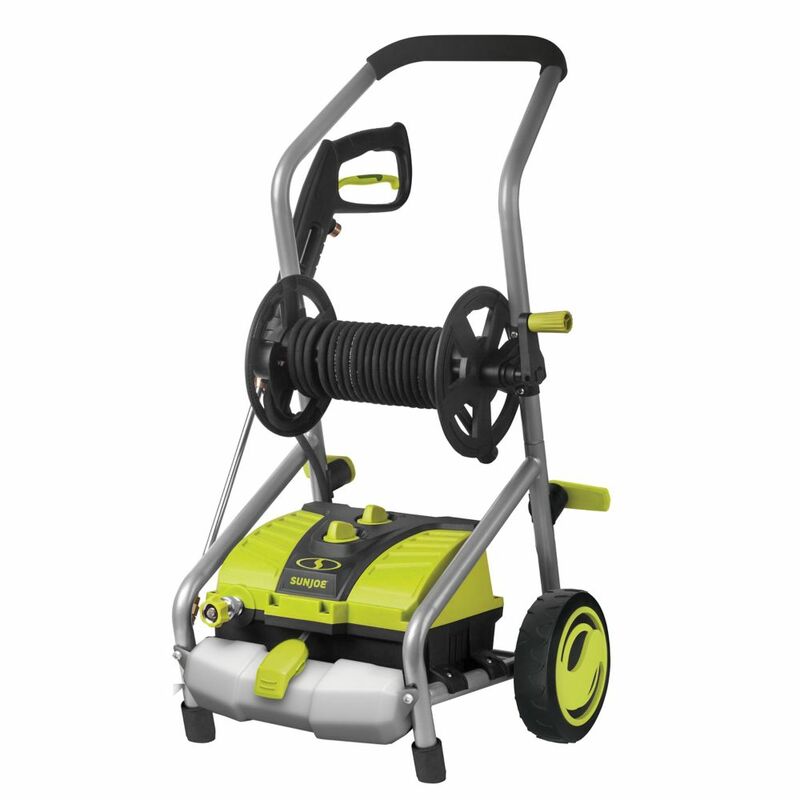 2030 PSI 1.76 GPM 14.5 Amp Electric Pressure Washer with Pressure-Select Technology and Hose Reel Tackle your toughest home, outdoor and auto cleaning projects with ease with the Sun Joe SPX4001 Electric Pressure Washer. Packed with 1800W of pure power, the 14.5 Amp motor generates up to 2030 PSI to demolish every last bit of dirt, grease, gunk and grime. Five Quick-Connect tips allow you to go from intense jet to gentle spray to suit the cleaning task and the onboard 1.6 L detergent tank lets you dial-in just the right amount of detergent to give your cleaning blast a boost. Featuring Sun Joe's exclusive Pressure-Select Technology, the SPX4001 lets you pick the perfect pressure to combat dirt and grime with professional results and a Total Stop power-saving system designed to save energy and prolong pump life when the trigger is not engaged. Other premium features on the SPX4001 include an onboard hose reel for quick and easy clean-up and storage, a 20 ft. high pressure hose and 20 ft. power cord. Cut your outdoor cleaning chores down to size and Go With Joe - the SPX4001 Electric Pressure Washer from Sun Joe. Get Equipped. 2030 PSI 1.76 GPM 14.5 Amp Electric Pressure Washer with Pressure-Select Technology and Hose Reel is rated 4.3 out of 5 by 192. Rated 5 out of 5 by JJddd from Very good! I chose this pressure washer because of the reel and also the pressure adjustments. I've used this to clean my patio with ease, but more frequently to wash my cars. It's nice to have the lower pressures settings so i'm not blasting the paint of my car. Foam cannon also makes for a gentler car wash. Rated 1 out of 5 by Wil from Purchased July 2017 and have only used 3 times. Poor power, engine sounds like its gonna blow up.... Purchased July 2017 and have only used 3 times. Poor power, engine sounds like its gonna blow up.. I was so proud that I had purchased power equipment that helps the environment, but NEVER again. Its been in my shed taking up space. I soooo much wanted this to work, but VERY DISSAPPOINTED. JOE DID ME WRONG! Rated 5 out of 5 by Manny from Easy to assemble. Very portable. Pressure select very useful. Pressure... Easy to assemble. Very portable. Pressure select very useful. Pressure washer hose too short. Should have been made longer. Rated 1 out of 5 by Jennifer from It did not handle the job of cleaning the patio... It did not handle the job of cleaning the patio or garage floor.